The Journal of Global Health (JoGH) is an international peer-reviewed journal open to researchers from all fields of global health and related research. 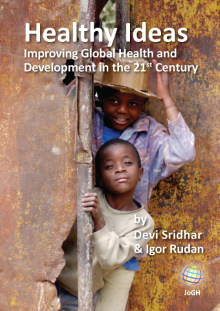 We welcome all contributions that enhance the understanding of global health and provide practice guidelines to address health issues in the developed and developing world. 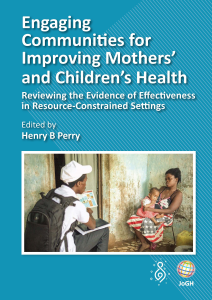 JoGH publishes original research, systematic reviews, viewpoints and other opinion pieces, as well as a collection of news from seven geographical regions, seven international agencies and seven resources important for global health. Viewpoints are commissioned from experts to present their views on important topics in global health. We also welcome suggestions for topics from individual authors. Viewpoints do not present research results and have no abstract. They are up to 1500 words long, with no more than one table or figure and up to 10 references. We prefer succinct messages rather than a review of the topic These manuscripts express personal views of the authors, and do not represent the official opinion of the Journal or its editors or the Journal's Editorial or Advisory Boards. Viewpoints are assessed in-house by Editors-in-Chief, Regional Editors and/or members of the Editorial Board for the relevance of the topic and interest to the Journal's scope and readership, before external peer review. The editorial office also performs technical editing of these manuscripts. Original research contributions, including systematic reviews and meta-analyses, do not have strict size-limits, but a common submission in this category has up to 4000 words (excluding the abstract and references), 10 tables/figures and 50 references (except for systematic reviews). The abstract should not exceed 350 words and should be structured in four paragraphs: Background, Methods, Findings, and Conclusions. Research submissions are read first by the Editors-in-Chief, who assign a general priority level: (a) manuscripts sent to reviewers immediately; (b) manuscripts returned to authors with suggestions for improvement of data presentation; and (c) manuscripts not suitable for publication in JoGH. The peer-review process includes at least two external experts, as well as a statistical editor if the manuscript contains statistical analysis of data. The editors make the decision based on the reviews received as well as the priority of the topic for JoGH. A list of reviewers is published at the end each Journal’s volume. The JoGH editors request authors to submit a pre-submission enquiry about their manuscript to Rachael.Atherton[@]jogh.org. Please check our full instructions for making a pre-submission enquiry at Presubmission enquiry . JoGH subscribes to the authorship criteria developed by the International Committee of Medical Journal Editors (ICMJE) : “The ICMJE recommends that authorship be based on the following 4 criteria: 1) Substantial contributions to the conception or design of the work; or the acquisition, analysis, or interpretation of data for the work; and 2) Drafting the work or revising it critically for important intellectual content; and 3) Final approval of the version to be published; and 4) Agreement to be accountable for all aspects of the work in ensuring that questions related to the accuracy or integrity of any part of the work are appropriately investigated and resolved." However, we are aware of the limitations of the ICMJE definition and its practical applications, and ask our authors to write in their own words why they think they deserve authorship of the submitted manuscript. Authors’ declared contributions to the research are published at the end of the article. JoGH also subscribes to the ICMJE uniform disclosure form for reporting all financial and personal relationships that might bias the authors’ work. We ask authors to fill out the form available at the ICMJE site and send it with their submission. JoGH also asks its reviewers to declare possible conflicts of interest related to the manuscripts under review. The Editorial Board of JoGH is devoted to the promotion of scientific integrity as a vital component of the research process. JoGH follows the ethics flowcharts developed by the Committee on Publication Ethics (COPE) for dealing with cases of possible misconduct. The COPE flowcharts are available here . As all editors and Editorial Board members at the Journal are active professionals and researchers, it may happen that they would want to submit their articles to JoGH. This represents a potential conflict of interest, especially in cases of submissions from decision-making editors. In reviewing submissions from its editors and Editorial Board members, JoGH follows the guidelines for good editorial practice set by international editorial organizations, such as the World Association of Medical Editors (WAME) and COPE. The review of such manuscripts will not be handled by the submitting editor(s); the review process will be supervised and the decisions made by a senior editor who will act independently of the other editors. In some cases, the review process will be handled by an outside independent expert to minimize possible bias in reviewing submissions from editors. Manuscripts should meet the general requirements suggested by ICMJE, described in detail here. We specifically emphasize the requirement for ethical conduct of research and protection of privacy of patients and study subjects, as defined in the latest issue of the Declaration of Helsinki – Ethical Principles for Medical Research Involving Human Subjects , developed by the World Medical Association. Ethical conduct includes mandatory registration of clinical trials in a public trail registry as a condition for manuscript submission to JoGH, as defined in ICMJE registration policy. You can download the EndNotes style template here. The full text of all articles published in the Journal of Global Health is immediately provided in open access and available to the public. We are committed to keeping articles freely available, with Creative Commons licences and deposit of the full text in PubMedCentral and on http://www.jogh.org. To support this, we accept Open Access fee of $1,500 for research articles and $750 for non-solicited viewpoints, on acceptance of the manuscript. This fee may be waived to authors from developing countries who do not have funds to cover the fee cost. Editorial consideration and decisions are not in any way related to the ability of authors to pay the fee, as the fee negotiation is handled by administrative staff of the journal. Please note that the Journal of Global Health has NO article submission charges. JoGH's open access publication fee enables full open access and the releasing of results into the open domain, including to researchers, policy-makers and other stake-holders in developing countries. It allows JoGH papers to be shared, copied and redistributed in any medium or format, adapted, remixed and built up for any purpose.